I want to thank all in the Rochester community for the opportunity you gave me to serve these past 12 years and eight months. This was the honor and privilege of a lifetime. Together for 12 years we made considerable progress in transforming a strong University into an ever greater one. We personified the spirit of Meliora. We were values driven: committed to academic excellence, academic freedom, diversity, and our community. We sought and supported the most outstanding faculty, students, and staff. We are an institution where all are welcomed here because of their talents and achievements, and the greatest discovery, dissemination of knowledge, education of our students, and cultural achievements are possible because of our unrelenting commitment to academic excellence. They are inevitably transitory. When we empower our faculty, students, and staff to think for themselves, we know that we invite differences among beliefs and passionate views. This is how we learn from each other and strengthen the quality of our conversation through the marketplace of ideas. Our University is immeasurably stronger because of our increasingly diverse faculty, student body, and staff. We are the Rochester family, where at best we support one another even under the challenging circumstances and uncertainties of the nation’s often polarized politics. I am particularly proud that during my time, our community was open and inclusive to all, regardless of identity, expression, or status. We are committed to our community. Since our University was founded in 1850, we have had a long and enduring relationship to Rochester. This is our home. We are proud of the ways in which the University connects to many in our community, who do not attend our schools, but are equally part of Rochester. The University during the past 12 years has stepped up its commitment to strengthen health care for all, to pioneer a model public high school with our commitment to East High, and to help address poverty, job creation, and economic development. I want to thank our allies in the political and social community who regardless of party or whether they worked at the federal, state, county, or municipal level often joined us to further academic excellence, diversity, and our community. Let me thank three special friends—Representative Louise Slaughter, Senator Chuck Schumer, and Assembly Leader Joe Morelle. During my time here we had a remarkable Board of Trustees. The Board too gave its heart and soul to the University of Rochester. I will always cherish my friendships with Board Chairs Bob Witmer, Ed Hajim, and Danny Wegman. Let me laud so many alumni who increasingly have supported our University. We have had a great leadership team. I worked with four talented Provosts—Chuck Phelps, Ralph Kuncl, Peter Lennie, and Rob Clark—and three outstanding Medical Center CEOs—Mac Evarts, Brad Berk, and Mark Taubman. I am deeply grateful to my senior leadership group—Chief Financial Officer Holly Crawford, a great successor to Ron Paprocki, General Counsels Sue Stewart and Gail Norris, Senior Vice President for Institutional Resources Doug Phillips, Vice President for Government and Community Relations Peter Robinson, our two amazing Chief Advancement Officers Jim Thompson, my first hire, and Tom Farrell, two great Vice Presidents for Communications Bill Murphy and Elizabeth Stauderman, the inimitable leader of our hospitals Steve Goldstein, my Senior Advisor Paul Burgett, who really has not been part of the University since the Earth’s crust began to cool, but likes to think so, and especially our irreplaceable Chief of Staff Lamar Murphy. We had amazing deans, too many to individually call out, but I particularly cherish the memory of Eastman School of Music Dean Doug Lowry, a dean and very special friend. Let me recognize all those who worked in the University. You were always wonderful. I thank all of you—the nurses and technicians in the hospitals, those who answer the phones or make sure we can park, our stalwart security officers, so many friends in IT. You are ever more vital to our University as we continue to grow, now with over 30,000 employees. I want to thank a great team of associates who work on my personal staff. They are all great, but let me particularly thank my Executive Assistant Sue Niggli and my Deputy Sasha Tulgan. Together we had a great ride. Universities are perpetual. An ambition of my presidency was to build a platform for future leaders. I believe with all my heart that the best days of the University of Rochester are yet to come. 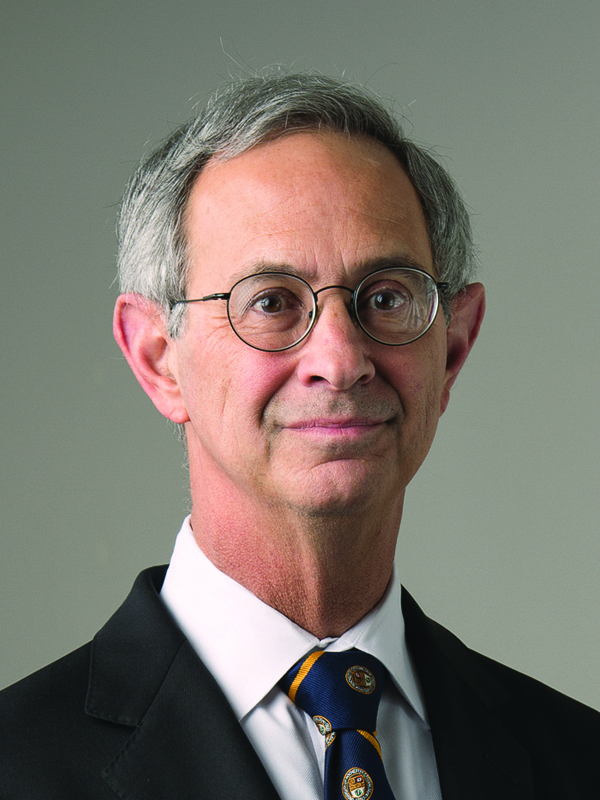 Joel Seligman announced on January 11 that he was resigning as president and CEO of the University, effective February 28. He made the announcement before the results of an independent investigation examining the University’s handling of claims of sexual harassment against a faculty member were presented to the Board of Trustees or were made available to the University community and the public. Richard Feldman, a former dean of the College and a professor of philosophy, was named interim president (see page 6). 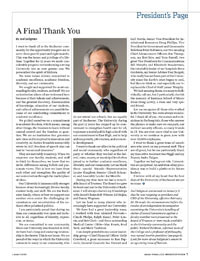 Look for more about Seligman’s tenure in an upcoming issue of Review.